Microsoft has completed its $US26.2 billion acquisition of LinkedIn, taking control of the world’s largest professional network in the process. After announcing its intention to buy the social media giant in June, Redmond has moved quick to finalise a deal that represents a marriage of business services in a cloud-focused economy. Billed as an acquisition of “professional convenience”, terms of the acquisition will see the cloud vendor leverage LinkedIn’s professional network of over 433 million members worldwide, leveraging Office 365 and Dynamics as a result. “Today I am even more enthusiastic about the common mission and sense of purpose we share, the similarities in our cultures, and the added value we can create for LinkedIn members, to help professionals transform how they work, realise new career opportunities and connect in new ways,” Microsoft CEO, Satya Nadella, said. Revealed via an Influencer article on LinkedIn, in the immediate term Microsoft announced its intention to pursue a “specific set of integration scenarios”, as the organisations prepare to combine intelligence and practices. As explained by Nadella, they include integration of LinkedIn identity and network in Microsoft Outlook and the Office suite, the addition of LinkedIn notifications within the Windows action centre while enabling members drafting résumés in Word to update profiles, search and apply to jobs on the network. In addition, the vendor will also extend the reach of sponsored content across Microsoft properties, integrate Enterprise LinkedIn Lookup powered by Active Directory and Office 365 while making LinkedIn Learning available across the Office 365 and Windows ecosystem. New developments will also impact the news desk across Microsoft’s content ecosystem and MSN.com, with plans in place to “redefine social selling” through the combination of Sales Navigator and Dynamics 365. “As we articulated six months ago, our top priority is to accelerate LinkedIn’s growth, by adding value for every LinkedIn member,” Nadella added. 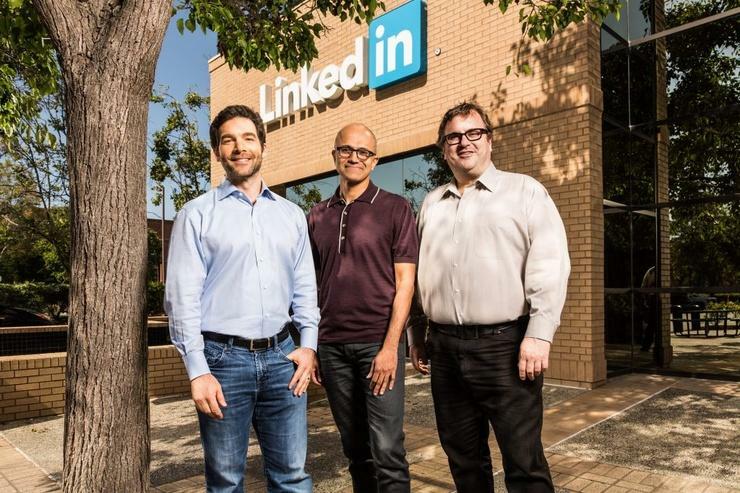 As reported by ARN, the deal will see Jeff Weiner remain CEO of LinkedIn, reporting to Nadella, with Reid Hoffman, chairman of the board, co-founder and controlling shareholder of LinkedIn, and Weiner both fully supporting the transaction. “Our companies are the world’s leading professional cloud and network,” Weiner added. “This deal will allow us to keep growing, investing in and innovating on LinkedIn to drive value for our members and our customers.